What's it about? Agatha Christie's famed detective Hercule Poirot (who is Belgian, not French, as the running gag goes) finds himself traveling on the legendary luxury train where a murder takes place. So many suspects, so little time. Whodunit? I'll never tell, though I suspect many in the audience already know the answer from the widely popular story and films. But the fun is not in the discovery but in the getting to the discovery. This can take many forms. Such as? : One can play it straight, as the film adaptations have done (though not without a sense of melodramatic flair.) But not so here. Meaning? : It's a yuck-fest -- which can be great fun -- and is, to a degree. But it's not everyone's cup of Christie. Purists might wince at the ham-heavy approach taken on this production. Others may just shrug and enjoy the train ride. Ham-Heavy? : There's some major scenery chewing going on which isn't easy given the fabulous, jaw-dropping, rolling set design of Beowulf Boritt. (Metro North execs please take note.) The sense of visual fabulousness continues with William Ivey Long's luxe costumes, especially that of Countess Andrenyi which looks like it could have stepped out of "Frozen." Ken Billington's lighting and Darron L. West's sounds design also contribute to the classy looking production. But the performances: Emily Mann directs the gang with fluidity and fun, with tongue firmly planted in the cheek, Some performance border on the Forbidden Broadway style of over-reach, which begs for the laughs -- but in the process the human factor and real emotion that might have come at the show's conclusion is lost. 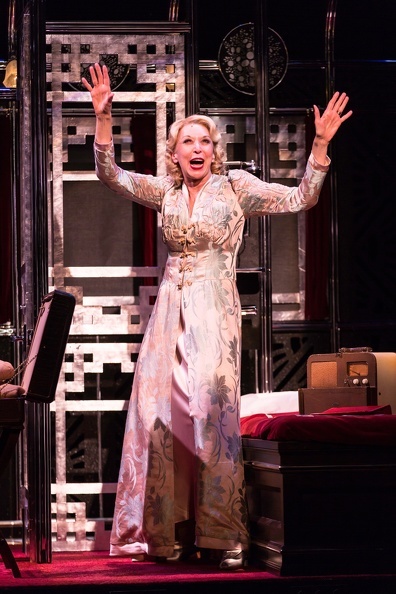 David Pittu gives a finely measured performance as Poirot while others go for broke with Julie Halston (a comic actress I've long admired) leading the play-it-broad pack by pulling out the stops as the wealthy and demanding Helen Hubbard. But Veanne Cox as Princess Dragomiroff shows you can get even more out of a role by doing less. Who won't? : Those who like their mysteries taken seriously. For the kids? : The theater advises that the show is suitable for kids 12 and above. There's nothing too salacious (er, I mean other than a bloody corpse). However, the complications of the plot may need to be reviewed at length after the play. Twitter review in 140 characters or less: Murder, She Gagged. Thoughts on leaving the parking lot: While it's fun to have fun, it seems that writers of mystery for the stage can only go this route of late. "An Inspector Calls" may have been the last production that I can remember that took the source material seriously. "Wait Until Dark" didn't have to joke it up about the blind heroine. And even when there's some playfulness involved -- think "Deathtrap" or "Sleuth" -- the human emotions were only minimally sacrificed for the fun. The basics: The show at the theater at 50 Church St. in downtown Hartford, runs through March 25. Tickets are $25 to $90. Running time is 2 hours, including an intermission. Information at hartfordstage.org and 860-527-5151.